It’s two years since the departure from his and our lives. Frank Sidebottom R.I.P. I doubt I’ll ever go to Timperley Labour Club again but that’s exactly where I went to watch this giant papier-mâché head and his repertoire of wit and sound northern humour. Not everyone’s taste but he tickled me. A devoted City fan, the role of a mascot can reach into many lives. 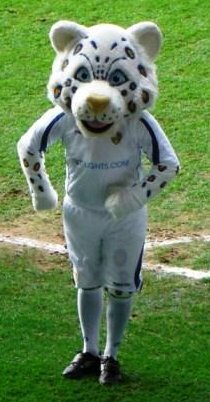 My Son remembers the trip to Elland Road not for County’s defeat but the leopard on the pitch. Of course, he’s now befriended Vernon Bear. There’s even been some unscheduled rivalry between these ‘figure-heads’ of clubs. But in the Year of the Olympics, I wonder if any special competition will materialise to the annual race.